Over the years, the definition has changed slightly. In 2013, it gained authoritative recognition when it was placed in the Oxford English Dictionary; the OED describes it as, “data of a very large size, typically to the extent that its manipulation and management present significant logistical challenges”.2 Today, data no longer carries negative connotations, and words such as “transform”, “revolutionise” and “advances” are often seen alongside data descriptions. Debatably, the challenges of big data have become significantly less, or have at least become overshadowed by the future prospects for big data. Today, computing power and global connectivity have assisted the advances in data gathering. 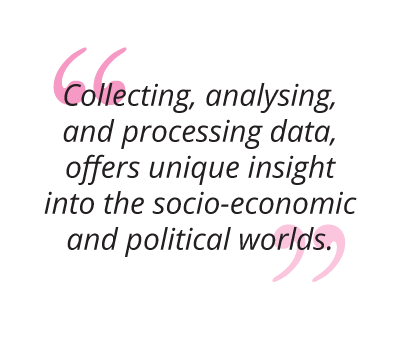 IBM estimates that by 2020, there will be 300 times more information in the world than there was in 2005.3 Collecting, analysing, and processing data, offers unique insight into the socio-economic and political worlds. Data allows businesses to understand the external climate, make better-informed business decisions, decrease waste, predict economic and market trends, and save financially. What consistently reveals itself in all of the data’s potential, is its impact on sustainability. Environmental and industry effects are often beyond the reach of a business’s control, they’re also the factors that can have the greatest impact on a business. Before the age of data, achieving a holistic understanding of internal business operations was a challenge; understanding the external, natural world was unimaginable. Now, businesses can interpret data and achieve an insightful perspective of their influencing markets and the interactions between the business world and consumers, suppliers and other organisations. Hitachi has taken corporate transparency to new levels by creating an online platform for suppliers to submit how they meet sustainability criteria. Data can reveal patterns and knowledge about the natural world of ecosystems, climate and resources. Once interpreted, data can reveal a rabbit-hole of information. For large corporations, (who have the biggest environmental impact) their value chain is overwhelmingly massive. When Carbon Trust, a company helping organisations to reduce their carbon emissions and become resource efficient, worked with BT, a multinational telecommunications company, they found that 92 per cent of BT’s emissions were outside of their direct control. About two-thirds of those emissions were from the supply chain, which includes 17,000 suppliers across the globe providing products and services totalling 9.4 billion pounds. Without the use of big data, information about emissions and where they come from wouldn’t be accessible, making sustainability efforts unachievable. Gaining an understanding of the entire end-to-end impact requires major metric measurements. However, the incentive of big data is indeed, revolutionary and transformational. It has the potential to reshape how large businesses approach and implement sustainable working methods. In order to achieve the SDGs, metric measurements from all UN members will need to be evaluated in a global sustainability indicator, and publicly shared. Climate change can potentially be measured by combining satellite imagery, crowd-sourced witness accounts and open data to track deforestation.7 Industry, innovation and infrastructure can investigate traffic improvements by collecting data from GPS devices. Gender equality development can be interpreted from the analysis of financial transactions that reveal the spending patterns and different impacts of economic instability on women and men. As the population increases, technology advances, and the internet of things weaves an even bigger web of connectivity – data increases exponentially. What’s apparent in how the UN propose to measure the SDGs is that the measurements depend on simple tech interactions; cell phones, computers and banking. All are basic personalised technologies that exist across the globe. Big data poses dynamic potential for sustainability initiatives. Accessibility of data has been enhanced by technological advancements in information gathering and analysis. Tech’s improvement in analysis also means that data provides unparalleled insight. As innovation continues to develop, so do the possibilities of how data informs our global landscape. Currently, big data is enabling businesses to realise, manage and act on their environmental impact – what has otherwise been unknown and out of their control. For the foreseeable future, society will be looking at innovative tech to guide, expose, and inform our business and sustainable decisions. INS Ecosystem Co-founder, Peter Fedchenkov, says that the platform could save consumers up to 30 per cent in grocery costs, while eliminating up to 130 million pounds of food waste annually.11 Tech’s contribution to sustainability is perfectly captured in the organisation’s model. Fedchenkov says, “Blockchain is here to help retailers improve the quality of groceries and reduce fraud, but more importantly, it allows farmers to trade directly with end buyers, provide them with lower prices and enhanced shopping experience.” The grocery industry is becoming inefficient for its own consumers, and INS Ecosystem has responded by becoming a unique distribution centre. 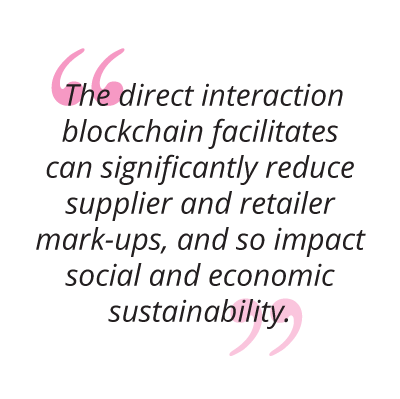 Building on blockchain’s ability to improve sustainability efforts, INS Ecosystem will also access data to generate highly individualised product offers, creating data-driven mass personalisation. Tech’s contribution to sustainability is perfectly captured in the organisation’s model. Fedchenkov says, “Blockchain is here to help retailers improve the quality of groceries and reduce fraud, but more importantly, it allows farmers to trade directly with end buyers, provide them with lower prices and enhanced shopping experience.” The grocery industry is becoming inefficient for its own consumers, and INS Ecosystem has responded by becoming a unique distribution centre. Building on blockchain’s ability to improve sustainability efforts, INS Ecosystem will also access data to generate highly individualised product offers, creating data-driven mass personalisation. Predictions estimate that by 2050, there will be a 40 per cent gap in global water supply. Simply looking at these two facts, water is sustainability’s biggest challenge. The World Economic Forum’s Global Water Initiative, in collaboration with the World Bank Water Global Practice and the Swiss Agency for Development and Cooperation, has been collectively researching how advancements in tech can improve the way this global crisis is managed. Blockchain’s ability to create transparent and shared transactions could revolutionise how water resources are managed and traded. Tech will help consumers and businesses make better decisions, by being aware of how and when to conserve water. It will enable families, market consumers, organisations and governments to access the same data on water quality and quantity.14 As the data is easily available, it will reduce the risk of corruption within water tampering, and even encourage resource sharing. Greenbiz explains how allowing access to the same data on water quantity and quality can inform decisions, such as a farmer sharing water resources based on weather, crop and market data, using information accessible through mobile devices. How is big data involved in creating sustainable smart cities? 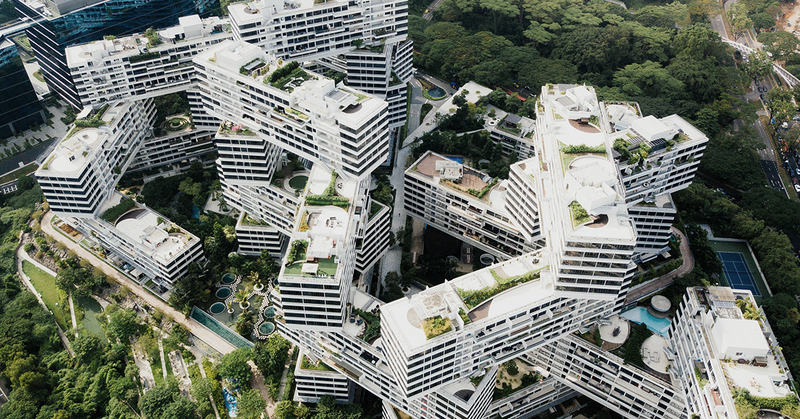 By 2050, the number of people living in cities will have doubled, from 3.6 billion in 2011 to over 6 billion.17 Sustainability has become an unavoidable urgency. If resources continue to be neglected they will eventually run dry, causing a ripple effect for the environment and global economy. Although the environment is the biggest cause for concern, as the world expands, there is the increasing pressure on public infrastructures. Urban areas are overpopulated and struggle to provide basic amenities like clean water and safe and reliable electricity. IESE Cities in Motion Index analyses 165 cities from 80 countries; a “smart” or sustainable city considers factors such as social cohesion, economy, environment, urban planning, mobility and transport, amongst others. 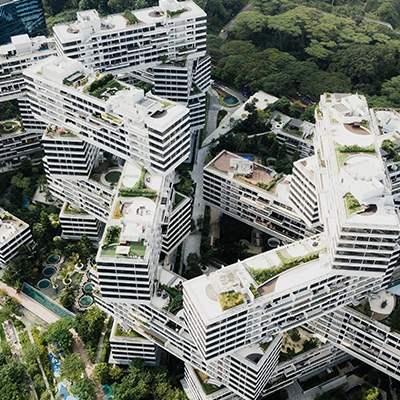 According to the index, to be sustainable, a city should create a landscape that focuses on reducing pollution, building strong and efficient public spaces, and be able to facilitate growth. Fremantle is just one example of how a city is embedding technology and engaging with data at a basic infrastructural level. Fremantle’s water system reveals a model that many smart cities will come to adopt. Smart cities, the number one being New York, create efficiency by relying on smart technologies and big data to enhance and innovate basic public necessities.19 Forbes estimates that by 2020, governments will be spending $400 billion a year building these innovation landscapes.20 Big data plays an essential part in creating these sustainable spaces, as society will interact and access information from the smart systems using their phones and other digital devices. Turning cities smart may seem a costly and advanced trend amongst the globe’s biggest and best cities, but it’s simply cities and governments responding to the pressure placed on vital infrastructure – a sustainable transformation that will become a global standard. Eventually, cities will run off data-driven systems that manage energy, water, transport, waste, and even safety. Previously, sustainability has been strictly associated with the public sector, however private businesses have begun to recognise its benefits. Contrary to the past, private corporations are developing the sustainable innovations changing our world. Harvard Business Review has been studying 30 large corporations and their sustainability initiatives. Their findings show that sustainability provides opportunities for organisational and technological enhancements, which yield both bottom-line and top-line returns.21 Becoming sustainable can lower business costs as companies reduce waste and save on input expenses. Sustainability can then provide additional revenue to be used for further innovation or business developments. Compliance and regulations are part of the reason sustainability has been left in the hands of governments. Environmental regulations vary across countries, and even within them. In essence, the compliance process is complex. However, as businesses are adopting the standards and making the legal investment in sustainability, they are realising the economic benefits and receiving consumer support as a result. A holistic environmental impact will only work if every aspect of production follows suit. Sustainability needs to be adopted by suppliers and retailers, to further reduce waste and prevent environmental implications. This stage provides the opportunity to redesign business strategies, and the way customers and businesses think of conventional practices. Business leaders and managers will need to develop the ability to create sustainable business solutions. The final stage speaks to businesses developing new innovations and new practices. This is where and how technologies and businesses such as INS Ecosystem and Power Ledger have emerged. Sustainability has lead to the revolutionary integration of disparate markets such as groceries and digital tech. Conventional platforms will soon be insufficient; business leaders will have to assume responsibility for the sustainability of companies, and for the greater environment. The opportunity to become sustainable represents one of the biggest business advantages. 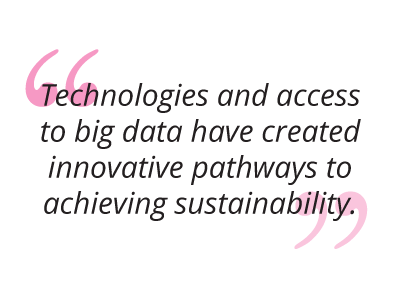 Technologies and access to big data have created innovative pathways to achieving sustainability. Harnessed together, technology can enable sustainability to be a realistic initiative that every citizen assumes responsibility of. As an individual, it offers the space to be an agent for positive change, and as a business, the results are economically inviting. The future, although scattered with technological challenges and mysteries, looks like a digital and innovative promised land. Integrating environmental and social concerns to any business model requires time, strategic expertise and vision. The University of Cambridge Business Sustainability Management online short course prepares individuals with the ability to develop sustainable business practices and strategies while learning to understand the challenges of sustainability. Become a member of the University of Cambridge Institute for Sustainability Leadership global alumni network, and collaborate with leaders across the globe.